Metropolitan Christopher of the Serbian Orthodox Archdiocese of Midwestern America’s paper kicks off the book, and my two big takeaways were a) as long as he feels that the term “diaspora” is being used as a club by the Ecumenical Patriarchate to reserve as much control over the North American situation as possible, or being used at all for that matter, a Council cannot function properly, and he invokes the rhetoric of Fr. Justin Popovic that the Council as currently planned would cause further division; b) the Serbs keep their own counsel on the question of jurisdictional unity in this country. Fr. Alexander Abramov, the representative of the Moscow Patriarchate to the United States, essentially says the same thing but with broader language; the basic points remain that Moscow doesn’t trust the EP’s intentions or procedures in trying to convene this Council, and that both the Patriarchal churches in this country as well as ROCOR may or may not choose to participate in a hypothetical united Orthodox Church in North America, depending on whether or not they perceive that it is in their interests to do so. Fr. John Erickson of St. Vladimir’s Seminary gives a very useful historical overview of the series of events leading up to the present efforts to convene a Council, starting in 1930 (and including the material I examine here). He also offers a respectful analysis of the issues surrounding Chalcedon 28; while he refutes the understanding of it as giving control of the entire “diaspora” to Constantinople, he also says that “this assessment is not meant to diminish the leadership role that Constantinople could legitimately assume within the communion of the Orthodox churches… In this quest for tangible unity, the Patriarchate of Constantinople can play a leading role” (pp. 38-9). Finally, the paper of Dr. Elizabeth Prodromou of Boston University is unique in two ways. One, it provides what is probably the most scholarly analysis of the present situation. Secondly, she unequivocally defends the immediate need for the Council and the Ecumenical Patriarch’s prerogative in calling one at what she believes is a moment in history where we must be decisive. Overall, as I’ve said before, I feel sometimes like we’re a family of people who don’t like each other too much. There are, of course, historical reasons for this, but I will say that in reading this collection of papers, I find myself wanting to hope more in what the academics have to say than the clergy. To sum up — it’s a quick read (80 pages or so), and provides a couple of exceptional essays as well as a good overview of what the various positions are. It’s worth your time. I mentioned earlier that I was researching the preparations that were going on in the 1970s for the Council that was supposed to happen at that time. Interlibrary loan hasn’t exactly been a ton of help; the acts of the preparatory meetings aren’t in any library that they can find, and then other publications are listed, but when a request is entered, it comes back as “unfillable”. Preparations are under way for a Great and Holy Council of the Orthodox Church, the first since the seventh Ecumenical Council of 787. No date has been fixed as yet, but it could take place as soon as the long stage of preparation is terminated. In 1974 the First Preconciliar Panorthodox Conference should convene at Chambésy near Geneva. Its task will be to examine the six reports prepared by the Interorthodox Preparatory Commission in 1971 and presented in this edition, as well as to revise the catalogue of themes for the Great Council which was prepared by the First Panorthodox Conference at Rhodes in 1961. The Great and Holy Council of the Orthodox Church is planned to be held in all probability some time during 1974 and, in preparation for its discussions, the Interorthodox Preparatory Commission, representing the various Orthodox Churches, was commissioned to draw up a series of statements on six topics proposed, in 1968, by the Fourth Panorthodox Conference. Well. I guess when you don’t have an emperor to see that things come together or else, four decade delays can happen, right? The first report, “Divine Revelation and the way it expresses itself for the salvation of man”, has some very interesting things to say about Biblical scholarship. …our Holy Orthodox Church declares that Scripture, being divinely inspired, preserves unimpaired within itself the presence of the Holy Spirit, in those revealed truths which it narrates, teaches and expounds for man’s salvation. In its words it preserves intact the collaboration between the divine and human factor in such a way that, even should the human presentation and clothing of God’s word be imperfect, yet the substance of the divine content of the revelation is not impaired. The essence and distinctive character of both remain intact; the human element is to be investigated according to human methods, while the divine aspect is not to be formulated in a one-sided, individualistic, and subjective fashion, but all the details are to be judged in accordance with the entirety of Holy Scripture and Revelation, and this entirety in its turn is to be judged in accordance with the Tradition of the Church from the beginning, there being but one source for both the unwritten and the written divine word. […]…it must be acknowledged that the attempt to ascertain which is the genuine and original Greek text according to tradition in the Orthodox Church, and the publication of an edition of the New Testament embodying such a text, is fraught with difficulties. This is especially so inasmuch as there exist several families and categories of different classes of manuscripts, on which most of the editions have been based, without any one of them being adjudged entirely accurate, complete, and perfect. Now, there’s an interesting thought — that the Orthodox should take a bolder, more central role in Biblical scholarship, and that we should maybe be looking to the Greeks to produce the definitive critical edition of the Greek text. It is the remaining four reports, “Adaptation of the ecclesiastical ordinances regarding fasting to meet present-day needs”, “Impediments to marriage”, “Concerning the calendar and the date of Easter”, and “Economy in the Orthodox Church”, where we get into material that no doubt sparks arguments. The report on fasting is actually an illuminating — and sourced — walk through the history of fasting practices in Orthodox Christianity. It ultimately recommends what I would hesitate to call a relaxation of fasting norms (although they use that word), but rather more of a pastoral acknowledgment that one size doesn’t quite fit all. This, of course, already happens frequently at the parish level; here the recommendation is that this be formally and universally understood as what is going to happen. One of the big specific changes the Commission recommends is something that the Antiochians already do anyway — eliminate fasting altogether between Pascha and Ascension. What’s fascinating, though — and what rather dates this text — is the bit about “the difficult circumstances in which” the faithful live necessitating changes. I would argue that nearly forty years later, at least in America and perhaps elsewhere, people don’t keep the fasts for exactly the opposite reasons — because their circumstances are great. Archimandrite Joseph (Morris), current abbot of St. Gregory Palamas Monastery in Ohio, tells a story about how after a homily given during Lent, one of the “cradles” in his parish came up to him and said, “Honey — ” (“They always call you ‘honey,'” he muses at this point in the story) “– Honey, I heard you talking about fasting. That’s the old country. We don’t do that here.” What seems to be implied is that many of the faithful with ethnic ties to the faith associate fasting with the poverty they or their forebears were trying to escape. To its credit, the Commission “acknowledges certain local pastoral difficulties” with enacting and enforcing this idea, and “therefore proposes that the time and way of applying the resolution should be left to the discretion of the local Churches” (p. 38). 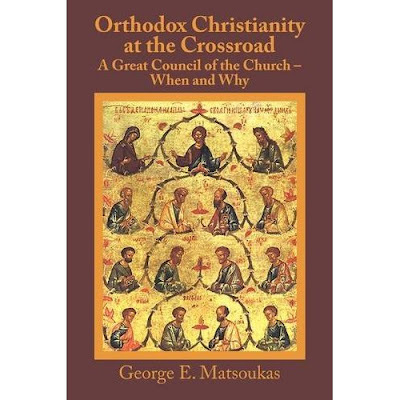 all [of Orthodoxy’s] relationships with [the other Christian Churches and Confessions] are founded on the quickest and most objective clarification possible of the ecclesiological question and of their doctrinal teaching as a whole. [The Orthodox Church] also recognizes that rapprochement with them will be brought about on terms having as their centre the divine-human structure of the Church. Yet she by no means intends to forget the existence also of the multiple pastoral responsibilities belonging to the Church of Christ, comprising her duty to preach the Gospel ‘unabridged’, and to remove from the conscience of the faithful everywhere all manner of censure; for it is truly a scandal to them that Christians are divided, since ‘Christ is not divided’ (1 Cor. 1.13). Our Holy Orthodox Church will in no way fail to apply akribeia [translated earlier as “exactness”] to those articles of faith and sources of grace which must be upheld, yet she will not neglect to employ oikonomia wherever permissible in local contacts with those outside her — provided always that they believe in God adored in Trinity and the basic tenets of the Orthodox faith which follow from this, remaining always within the framework of the teaching of the ancient Church, one and indivisible. Within the bounds of economy — identified with the extreme loving-kindness of the Godhead — to find ways and means of applying this economy to the contemporary situation of good relations between the Christian Churches; with a view to furthering all aspects of common life in Christ: ecclesiastical practice, worship, common prayer, theological collaboration and consultation, etc., until the efforts of all the Churches toward union have been crowned with success. Finally, the Commission maintains that, economy being the particular prerogative of the Orthodox Church and which “constitutes the only means whereby the church makes allowance for human weakness” (p. 51), these goals would constitute an application of economy “so that the work of man’s salvation on earth may come to fulfilment and all things may be reconciled in Christ at the last day” (p. 52). If somebody would like to lend a hand in helping me unpack all of that, I’d be much obliged. It seems like there’s a lot there to which the people who feel strongly, one way or the other, about ecumenical activities might react, and I invite comments from all sides. What is the most telling report of all in this little book, at least to me, is the section “Impediments to marriage”. Of particular interest is the two pages dealing with mixed marriages; we may sum up these two pages by saying, “We all handle this question a little differently, so we’re not sure what to do here.” It observes that each national church has a varying practice when it comes to mixed marriages, and that uniformity of practice would be good, but they are uncertain how to achieve that. Thus, “the Commission proposes that ways and means of applying economy in this matter be studied, and that in the meantime it should be left to the local Orthodox Churches to determine whether to apply economy under circumstances of necessity” (p. 35). I had a professor of medieval history in my undergrad who said that a problem a unified Christendom ran into was that differing practices don’t have to be a problem, but that only works as long as they don’t have to be right next to each other, or as long as two groups in communion with each other but with different practices aren’t trying to evangelize the same people. Along related lines, in reading Clogg’s A Concise History of Greece recently, it became clear to me that part of the reason the various ethnic jurisdictions kept to themselves in this country for so long is because, well, they don’t like each other too terribly much (and not for bad historical reasons). I am reminded of an edict from Rome I heard discussed a few years ago that Byzantine Catholic married priests are to stay away from the Vatican, because they will only serve to confuse the issue of priestly celibacy. Basically, the reality of different practices seems to be, “Sure, we can coexist and be in communion, but I’m afraid your difference in how you do things will only confuse my people if we interact too closely,” with a concomitant fear that efforts to standardize practice can only result in laxity (or rigidity, perhaps). The Orthodox diaspora, where the jurisdiction over the Orthodox flock beyond national borders will be defined. According to the canons now in effect, before the growth in the phenomenon of emigration the faithful outside of their home country belong to the ecumenical patriarchate. The manner of recognizing the status of autocephalous Church. The manner of recognizing the status of Church autonomy. Dypticha, meaning the rules of mutual canonical recognition among the Orthodox Churches. Establishing a common calendar for feasts. For example, some Churches celebrate the Nativity on December 25, others 10 (sic) days later. Impediments and canonicity of the sacrament of matrimony. The question of fasting in the contemporary world. Relationships with the other Christian confessions. The contribution of the Orthodox in affirming the Christian ideals of peace, fraternity, and freedom. Nos. 5, 6, 7, 8, and 9 seem to be directly related to what’s discussed in Towards the Great Council; we’ll see how much has changed in the intervening years when it comes down to actually talking about them. Meanwhile, I’d still love to get my hands on the other preparatory materials from the 1970s in a way that doesn’t involve me having to travel to Geneva. If anybody has any thoughts, I’m all ears.